If you’re reading this, chances are you have interest in flying a radio controlled airplane. The best RC planes are mostly subjective as most have different tastes in things, but reviews don’t lie. There’s an ENORMOUS range of choices… literally there’s hundreds of different variations you can choose form. It all comes down to is how long do you want to fly, what budget do you dedicate to spend, and what your skill level at this time. With all those things in mind, i’ve picked a set of RC plane kits that are EXCELLENT choices for beginners. Don’t you love it when things are made easier for you. 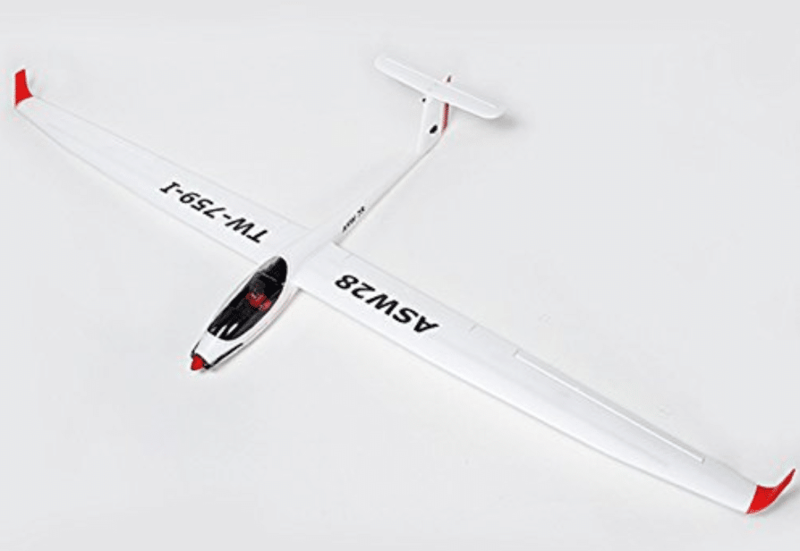 Without having to DIG for an rc plane that is loved by many users, 5 excellent rc airplane kits that are both ready to fly (RTF) and almost read to fly (ARTF). Below you will see a link that will take you directly to Amazon, this is where we you can typically find some of the best deals online (sometimes depending on the season). Lastly, we also make a small commission if you make any purchases through our links(we thank you in advanced). 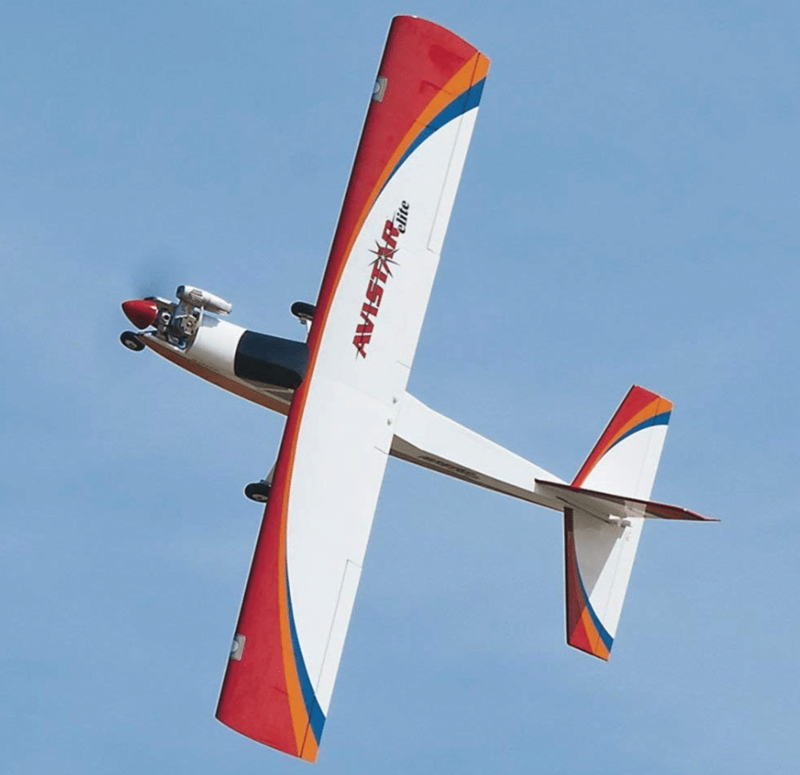 The GreatPlanes Avistar Elite, is our #1 best remote control airplane for beginners, intermediates, and experts. Seriously, there’s a reason why it’s so darn popular! Out of the box, it has all required things to start flying. Aside for fuel, there’s really not much else you’d need that would seriously hold you back. Great-Planes (GP) is known for making a variety of models, from planes, flight sims, and a wide variety of spare parts that would make repairs a piece of cake. Let’s now dive deep into the primary features and what specifically makes it good. This plane as mentioned above, is an excellent started for trainers. At the same time, professionals who want to fly solo or teach others can easily maneuver it. Being an RTF, makes it ready out of the box. Aside for fuel and batteries, you have everything needed to start flying. The high mounted wing, gives it higher stability and nimbleness. Also the landing gear, makes it easy to bring down. To control the entire plane, you’ll be using the TTX600 6-channel 2.4GHz radio. 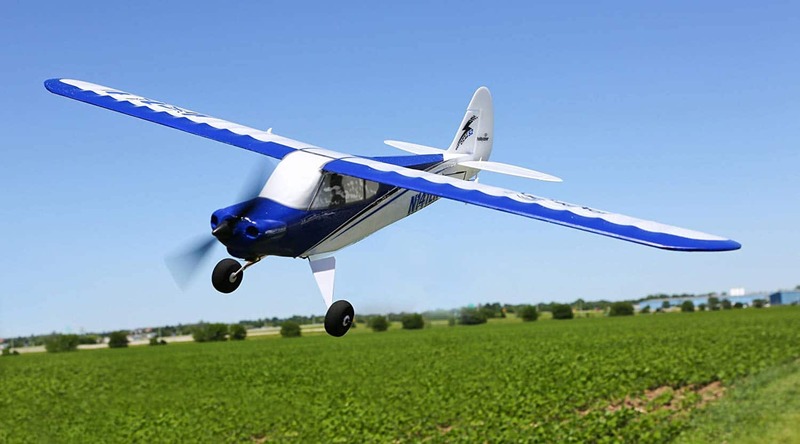 Dual rates on elevators, ailerons, rudders, digital trims and servo reversing, wireless trainer system, adjustable stick lengths, and a low-voltage alarm. Makes an excellent trainer & all-around airplane. Without a doubt, ideal for almost any kind of flying. Ready to Fly out of the box, aside for the obvious things like batteries and gas, you’re ready to go! Due to its top mounted wing, its flexible for being a big plane, and allows you to perform sharp menuevers. Being a gas powered airplane, it does a good job at muffling the sound output. Price point is a bit steep, especially if you have a tight budget in mind. Would of been nice to see a brushless option. By comparison to the #1 mentioned previously, this one is 3x cheaper and just as fun. 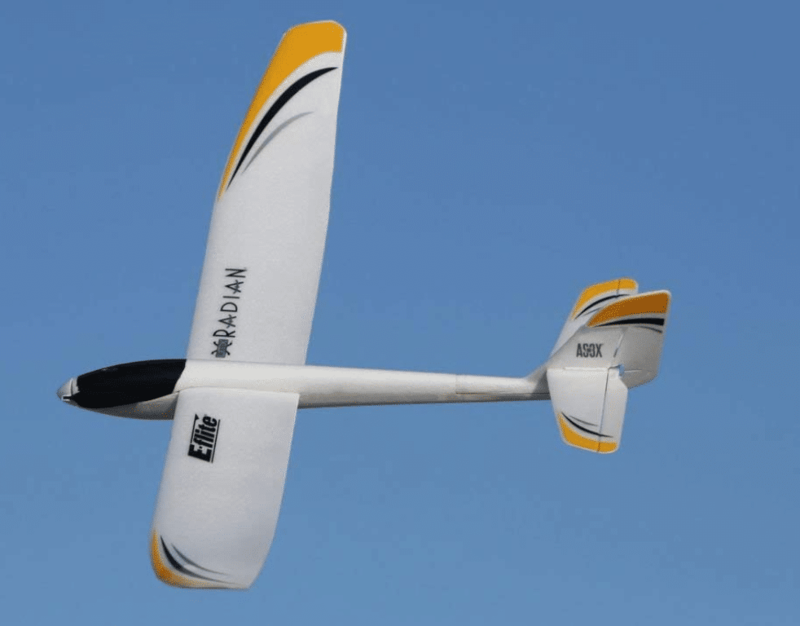 What sets apart the electric E-Flite U2980 Radian is how it’s designed, it’s a glider. You see, it’s really designed to let the wind take its source. You being the pilot, have to steer it towards with and against the wind. It launches exclusively by hand with NO landing gear or any fuss. You’d think that landing it is a giant pain, but actually it isn’t. It’s so lightweight, it will land with very little space and suffer little to no damage even at the harshest hard landing. It’s affordable, lightweight, and small. The perfect recipe for learning to fly. The only thing you must keep in mind the if you’re thinking about going outside and launching it is, how strong is the wind. That’s something you need to keep in check, it doesn’t like anything higher than a mild gust. Let’s talk about the features and benefits, shall we. For the flight time you can get, everything is upgradeable. Going from 150 mAh battery to 300 should see nearly double the flight time. Same can be said for the motor. With a efficient motor, you’ll be able to get 8-10 minutes of flight time. Upgrade to a higher capacity battery to get even more. The first important feature this airplane has, is the lightweight structure – 43 grams! Controlling this gentle glider, is a 3-channel remote. Not designed to give you many functions except for the basics. AS3X system provides stability easier control with the 3-channel remote. This glider is extremely lightweight and easy to fly. Whether you do it in a tight space or in a big open field, there’ should be no problems. An impressive amount of flying time for such a small aircraft and battery. Easily, you’re able to double and triple it by purchasing additional batteries (4 pcs for less than 15 dollars). You can be out in the field, and recharge your batteries using the included usb charger. Even with the AS3X stabilization, wind can get ahold of this glider due to its size. If you’re stuck with the single battery it comes with, running it down and waiting for a recharge is inconvenient. In terms of price, the HobbyZone Champ is not far off in terms of value. However, the thing that sets it apart from the previously mentioned E-Flite is that this ready-to-fly plane can land normally. It’s not an electric glider, nor is it a super fast flying machine.. what it is, is a gentle park toy that will take-off and land on smooth ground where there’s little to no gravel. From our research, it managed to be the most popular toy in the list. Many users have flown it and in a big margin, agreed it’s value and fun-level. Without getting too deep into the pro’s and con’s, expect the flight time at around 10-15 minutes if you’re demanding too much, and not vertical climbing. Enough with that, let’s really dive into the features, benefits, pro’s and con’s! The HobbyZone Champ is just that, a Champ. A little one, for it is an agile little plane that is so simple to fly, kids will little experience can. With eh 1S 3.7V 150mAh Li-Po battery, you can expect to fly 10-20 minutes. Easily increasing this by buying a few more batteries, which are VERY inexpensive. Resilient foam construction, easy to repair with simple epoxy. Spare parts are also inexpensive. The remote is a 2.4GHz transmitter with Spectrum DSM2 technology. This allows to fly from signal interference whenever and wherever you go. Quick take-off makes it nice to fly in smaller areas. Some have reported going from ground to air in as little as 10 feet. Small, agile, easy to fly, and bounces back easily when crashing. Ready To Fly, easily stows into a shoe box, and can give over an hour of flying (given you buy the extra battery packs). Also, charging can be done via USB charger. For children and adults, it makes for a good learner. It takes off in short runways or can be launched by hand. No interruption of signal using the 2.4GHz transmitter. Wind can strongly take control of this plane. It’s advised that flying outside is done with 5 > mph winds. If you thought this was one of the best looking planes around, you’re not alone. We thought this was worth mentioning just because of the looks. But of course, that is not the only reason why. There’s quite a few. Unlike the above mentioned models, this is a almost ready to fly kit. This means you need to buy a few more things before you can start taking it to the skies. Now, typically this would be a brushless motor, battery, ecu, receiver, servos, and a few other things. Getting it ready for flying isn’t that expensive, your budget can dictate that. For as little as 50 dollars if you budget appropriately, you can be ready to get started. Now I bet you want to know some key features that make it our #4, and right below everything will be explained. The entire plane is constructed of EPO and PP material, which goes further than ordinary foam used. It features a 850KV brushless motor, which brings in adequate push to climb higher altitudes (a place where they you can let wind take control and use little to no battery). From start to finish, you can assemble this kit with ease. Although not included, it’s nice to know exactly what kind of system suits this glider best. Using a 2.4GHz controller should give a max flying range of 656 yards and a 1500 mAh 20C LiPo battery will help you reach that. Excellent build quality combined with great design for flying seamlessly. EPO and PP materials used in the overall structure and sleek aerodynamic shape. Easy to control, as there’s few servos used to operate the gliders functions. Can fly long distances with the right set​​​​up. None, other than not having a radio transmitter included. If you’re looking at this and have seen the #3, then they look very similar. In fact, the only difference would probably be the styling and color (yes, color for sure). But other then that, the HobbyZone Sport-Cub S as well makes an excellent flyer for small to medium sized places. Everything you need is included inside the box once you receive it. All skill levels from beginners to experts can operate it with no trouble whatsoever. Assembly first of all is a cinch and should only take 5-6 minutes at most.Now there’s a few more benefits and features you should know about, go ahead and continue reading to find out more. If you’re looking at something that costs roughly 100 dollars, it’s ready to go out of the box. Again, this is the kind of plane you’d get if not only you, but someone else inexperienced wants to have a go. The specs for performance may be weak for power, but the beauty is within the low energy consumption of the little brushed motor. Combined with the included 1S 150mAh 3.7V lipo battery, you’re getting over 10 minutes of flying time. Unlike a few other types of planes, where you have to manually launch it by hand, with this one you can take-off using its landing gear. How it works is by helping you battle windy conditions, learn some of the basic and advanced skills in using the multiple flight modes, and lastly, regain stability with a pull of the trigger. It features SAFE technology. As the abbreviation implies, it makes flying a bit more safe for you. SAFE technology keeps it stable, especially in windier conditions. 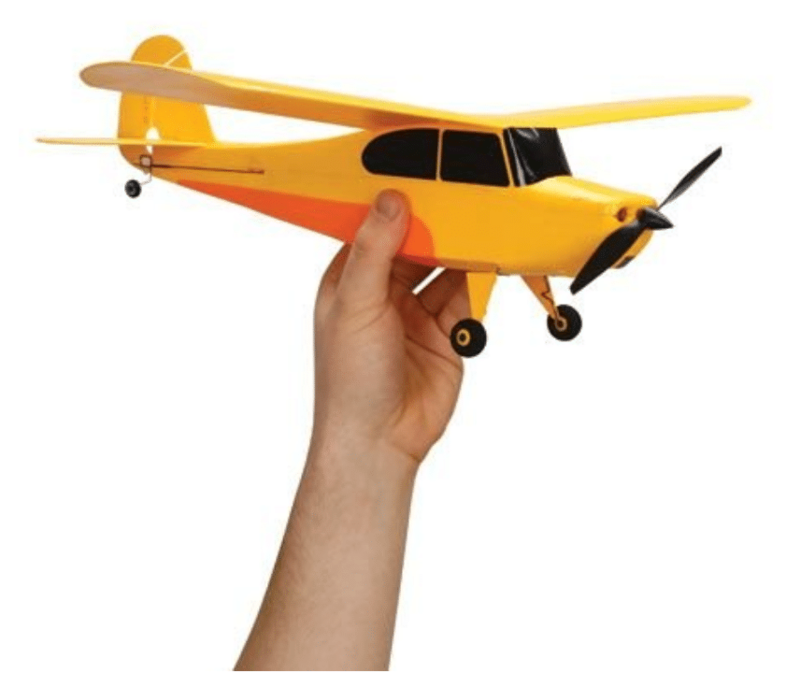 Plane is PERFECT for beginners, it’s cheap, easy to repair, and replacement parts are very inexpensive. It’s easy to take-off and land. Included landing gear allows you to turn left or right while moving on the ground. Wind is often a big issue, considering this plane weighs next to nothing. ​How do I learn to fly any RC plane? There’s a guide on our site which shows you the best RC plane flight simulators that allow you to learn before you ever buy your first plane. Read that if that is your current situation. Otherwise there you have it, a guide showing you 5 of the best RC planes you can buy today, and start flying tomorrow. I’d like to add that whether you buy a ready to fly airplane or a almost ready to fly kit… you’ll have an amazing time either way. Whether you choose a electric or gas powered, you are guaranteed to have a blast as long as have the proper practice in place. Should I go electric or gas? This is an excellent question to ask, and it comes down to a few things. First, you need to know where you’ll most likely be flying your airplane. If it’s where noise restrictions are present, you might want to think about going towards electric. If you’d like to read our entire guide on Electric VS Nitro RC Planes, we have it for you. This guide will tell you all the pro’s & con’s there is. Final, Do I Buy or Make at Home? Of course, there’s more then one option when it comes to flying. You can either create a pre-made kit and put it together, or build your own from complete scratch. This requires some skill and knowledge of how to do so… luckily, YouTube.com is an excellent source to learn. I have an article about making a homemade rc plane here. You will enjoy if working with your hands is your thing.